Looking for a sophisticated birthday gift that will really take their breath away? 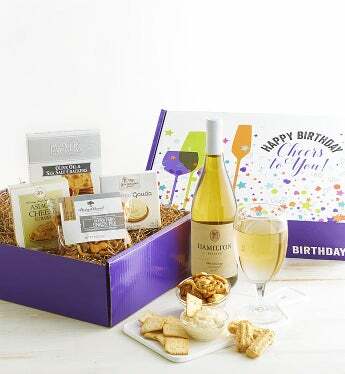 Send this versatile, handsome white wine gift box. Discerning wine lovers will relish the flavorful, bright 2017 Hamilton California Chardonnay as well as the exceptional selection of gourmet snacks including savory Gouda flavored cheese spread paired with Partners® Olive Oil & Sea Salt Crackers, Harry & David® Party Snack Mix, and Mississippi Cheese Straw Co® Asiago Cheese Straws. Arrives in a tasteful Happy Birthday gift box.